Oyster Bay is one of several East Bay Regional Parks along the east side of the bay that is a former garbage dump built on landfill. 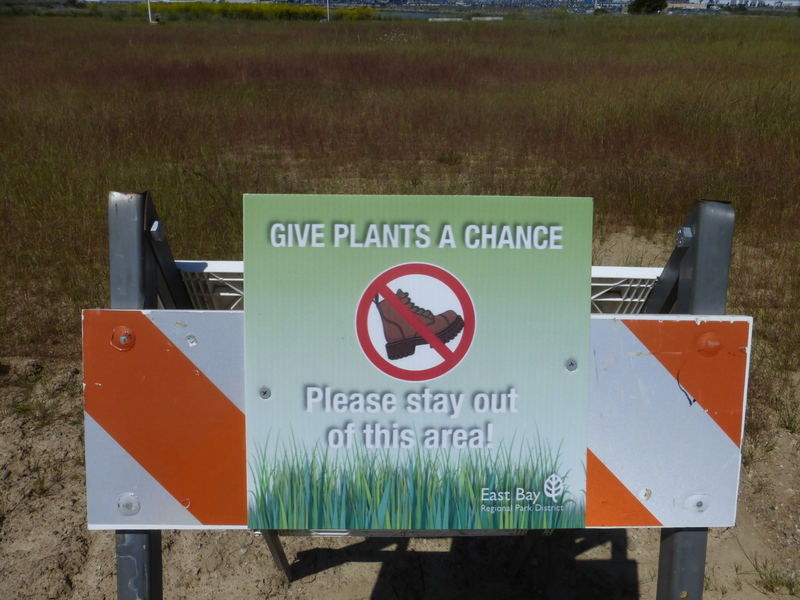 We visited Oyster Bay for the first time in 2011 after a former Deputy General Manager of the park district told us that it is a “beautiful native plant garden” and a model for a similar project at Albany Bulb, another former garbage dump being “restored” by the park district. When we visited seven years ago, we found a park in the early stages of being destroyed in order to rebuild it as a native plant museum. 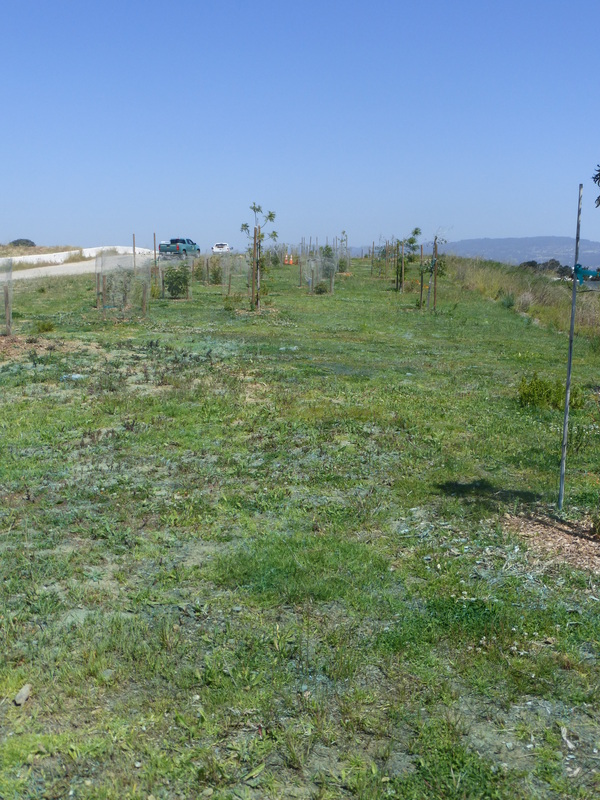 Since there were never any native plants on this landfill, we can’t call it a “restoration.” We took many pictures of the park in 2011 that are available HERE. Seven years ago, most of Oyster Bay was acres of non-native annual grasses. Since then, most of those acres of grassland have been plowed up and are in various stages of being planted with (one species?) native bunch grass (purple needle grass?). 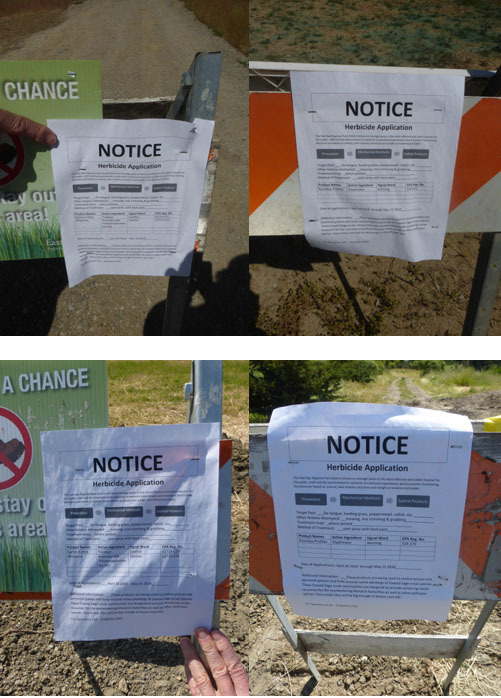 On our May 1st visit, there were at least 8 pesticide application notices posted where the native bunch grass has been planted. Several different herbicides will be used in those sprayings: glyphosate, Garlon (triclopyr), and Milestone (aminopyralid). 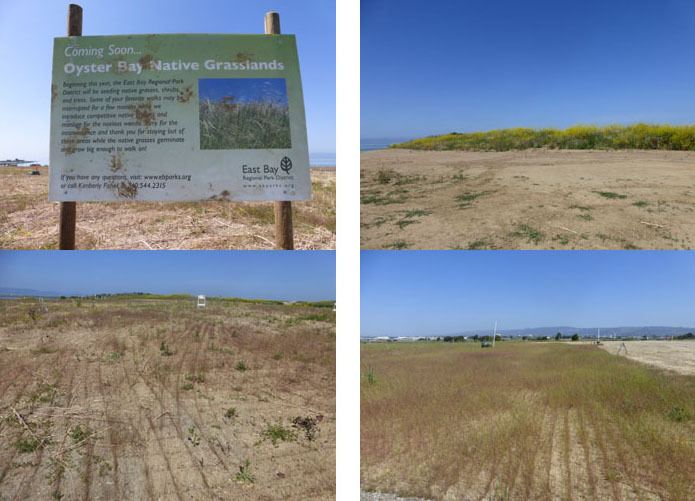 CalTrans gave academic scientists at UC Davis nearly $500,000 to convert 2 acres of non-native grassland to native grassland. The scientists used many different methods: plowing, herbiciding, and burning the non-native grasses, then plug planting and broadcast seeding native bunch grasses. They ran out of money after 8 years and declared victory. They defined “victory” as 50% native grasses that they predicted would persist for 10 years. 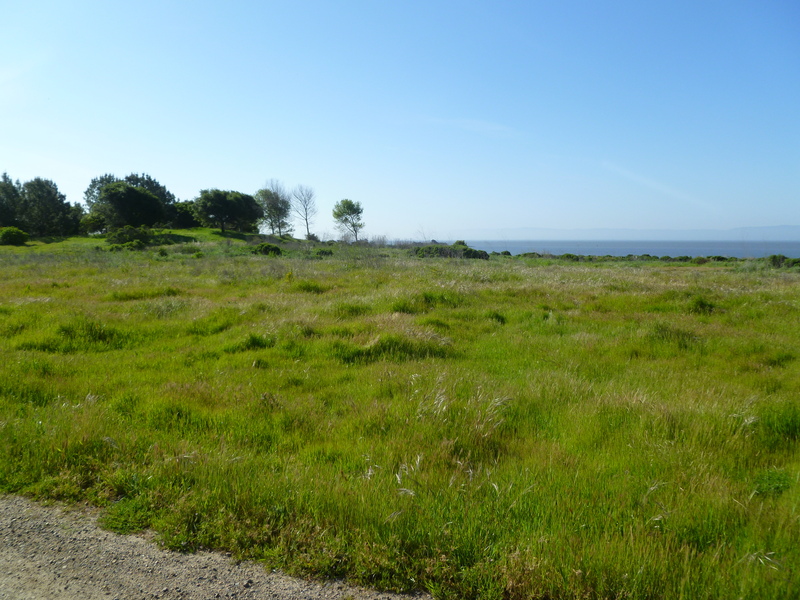 In a book about California’s grasslands, an academic scientist described 18 grassland “restoration” projects, none of which were entirely successful. The book explains why native grasses are unable to compete with non-native grasses. 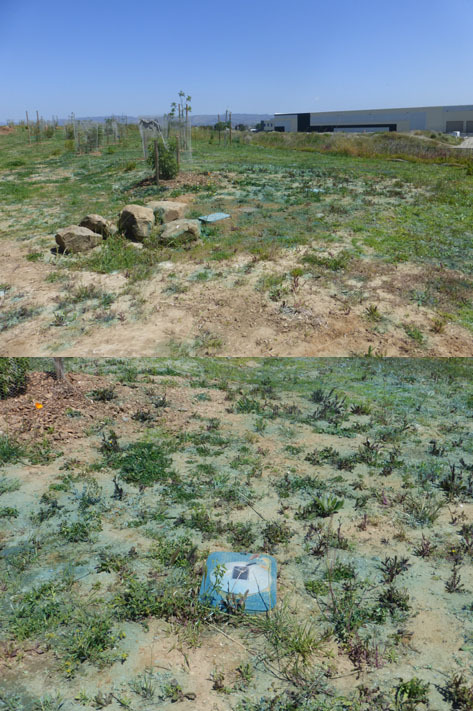 The park district conducted a similar experiment on Albany Bulb, which is another former garbage dump built on landfill. The experiment completely failed to establish native plants there. When we visited Oyster Bay in 2011, many trees had already been destroyed, but there was still a dense forest of non-native pittosporum. That forest is gone and the park district has planted one small area with native trees as a “visual screen” of the Waste Management Facility next door. We identified these native trees and shrubs: ironwood (native to the Channel Islands), coast live oak, buckeye, toyon, juniper, mallow, holly leaf cherry, and redbud. We also saw a notice of herbicide application near the trees. 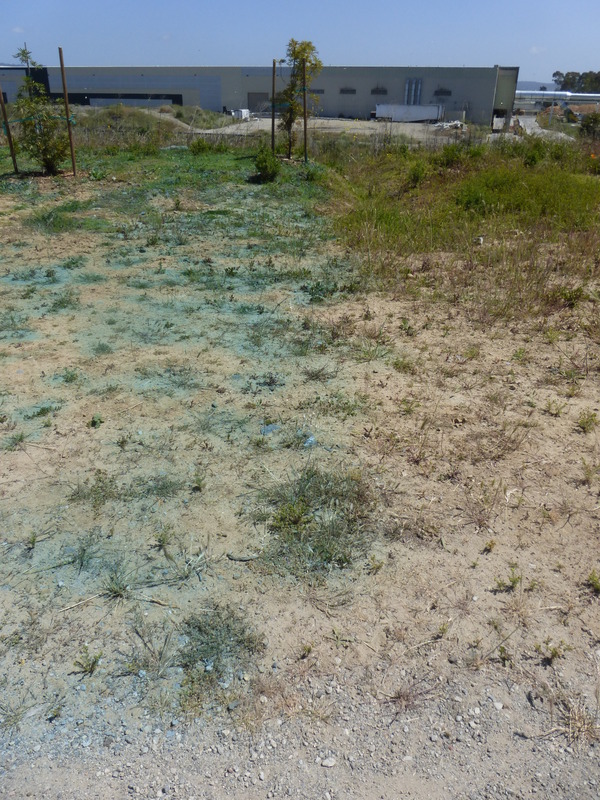 The ground around the trees was covered in green dye, which is added to herbicide when it is sprayed so that the applicator can tell what is done. There were men dressed in white hazard suits, driving park district trucks, apparently getting ready to continue the application of herbicides. Will the trees survive this poisoning of the soil all around them? There are many examples of trees being killed by spraying herbicides under them. Herbicides are often mobile in the soil. Herbicides damage the soil by killing beneficial microbes and mycorrhizal fungi that facilitate the movement of water and nutrients from the soil to the tree roots. That is a PATENTLY FALSE statement. 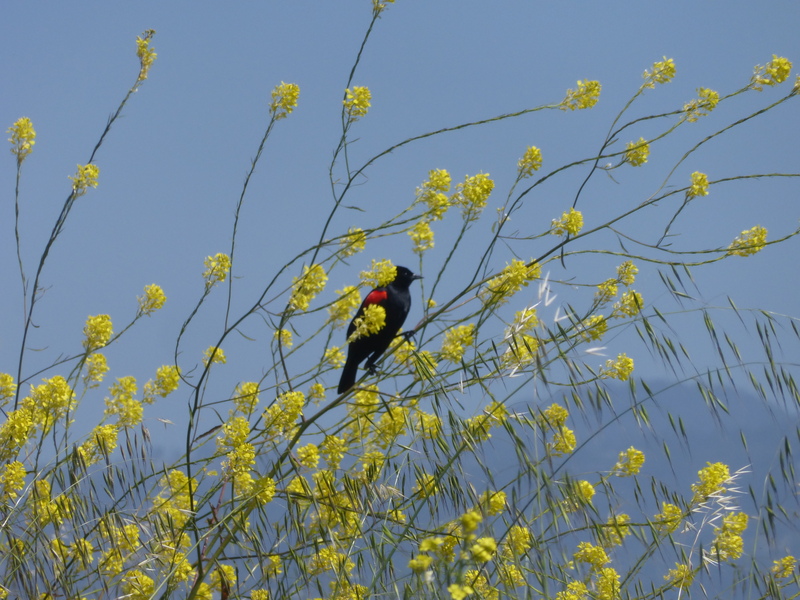 The California Invasive Plant Council conducted a survey of land managers in 2014. Ninety-four percent of land managers reported using herbicides to control plants they consider “invasive.” Sixty-two percent reported using herbicides frequently. The park district’s most recent IPM report for 2017 corroborates the use of herbicides to eradicate plants they consider “invasive.” The park district report also makes it clear that they have been spraying herbicide for a very long time. For example, they have been spraying non-native spartina marsh grass (in the bay and along creeks) with imazapyr for 15 years! Attempting to eradicate non-native plants is NOT a short-term project. It is a forever commitment to using herbicides…LOTS of herbicide. To claim otherwise is to mislead, unless you are completely ignorant of what is actually being done. Proposition 68 will provide $4.1 BILLION dollars for “park and water” improvements. It will be on your ballot on June 5, 2018. Roughly a third of the money will be allocated for “protection of natural habitats.” (1) Although the project at Oyster Bay does not look “natural” to us, that’s how the park district and other public agencies categorize these projects that (attempt to) convert non-native vegetation to native vegetation. Measure CC renewal will be on the ballot in Alameda and Contra Costa counties on November 6, 2018. The park district has made a commitment to allocate 40% of the available funding to “natural resource projects.” Although the anticipated revenue (about $50 million) seems small, it is used as leverage to apply for big State grants, which require cost-sharing funding. Measure CC is essentially seed money for the much bigger federal and State funding sources. I would like to vote for both of these measures because our parks are very important to me. If voting for these measures would actually improve the parks, I would do so. But that’s not what I see happening in our parks. What I see is a lot of damage: tree stumps, piles of wood chips, dead vegetation killed by herbicides, herbicide application notices, signs telling me not to step on fragile plants, etc. What a sad but beautiful and necessary article! Thank you so much. I can imagine how painful it is to see the devastation and know the harm that the EBRPD is continuing. They need to be held accountable. I’m guessing if everything we know was public to voters, as well as the extent of deaths to humans and animals caused by the EBRPD continued poisoning, things would dramatically change, but they can out-spend to spread their lies and propaganda, so most people have no idea what we are paying for. It’s clear by now, as you said, that nativism does not work. Certainly some people are making a lot of money from it, but there is no way poisoning the environment can bring back what existed hundreds of years ago, and most people do not want that anyway, which we can see by what people choose to plant. Pittosporum from New Zealand and Australia do beautifully here. We are lucky to have them and all the other introduced plants who seem now better suited to our changing climate than many natives. I agree to vote against both proposals and to spread the word, until the EBRPD stops harming our health, the environment, poisoning our air, water, earth, the bay and all the animals struggling to survive.